Pressure chamber medicine. 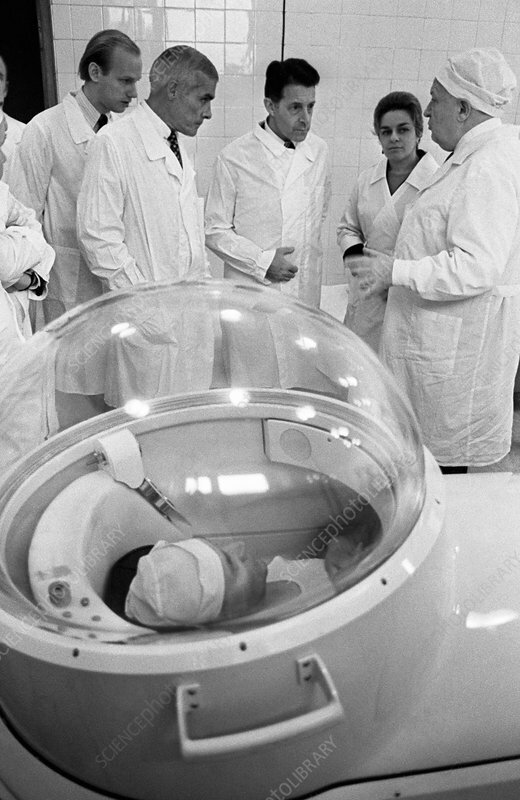 Soviet surgeon and health minister Boris Vasiljevich Petrovsky (1908-2004, right) explaining to a visiting US delegation the design and purpose of a pressure chamber. The chamber contains a patient. Petrovsky was a general surgeon who specialised in cardiovascular, transplant and oesophageal surgery. In 1965, he performed the first kidney transplant in the USSR. That same year, he was appointed minister of health and proceeded to reform Soviet medical education. He served until 1980, making him the longest-serving Soviet health minister. Photographed in 1974, in Moscow, Russia.